What Does a Biologist Do All Day? I'm a molecular pharmacologist, but what on earth does that mean I do at 10am on a Monday? The vast majority of my PhD in Medical Sciences has been spent in a dark room, counting. Counting breast cancer cells that have moved. YES, moved. I work with breast cancer cells that have been taken from a donor who had breast cancer. Cancer cells can be grown in a laboratory environment if you give them the correct nutrients and keep them at the correct temperature, a cosy 37 degrees, just like in the body. The cells I use were collected back in the 1970s and have been kept growing in the lab ever since. The cells grow in 'media', a solution that contains all the nutrients they need to grow. The media is usually pink as it contains phenol-red, an indicator that changes colour if the pH of the media changes (pH needs to be around 7.2-7.4 for optimum growing conditions). So, those are the cells. I'm looking at some potential new drugs and I am trying to work out if they might help by blocking the movement of cancer cells. Cancer grows and spreads through the body with catastrophic effects. One way the cells get around the body is by moving. The process of cell movement, and the establishment of cancer at a secondary site in the body is called metastasis. How do I quantify if these 'new drugs' might stop the movement of the cancer cells? The chamber I use has 96 of these individual wells (yep 96!). The picture below shows the view looking in to the top of the chamber. I use 3 wells for each drug treatment. After leaving the cells for 4 hours I take the membrane from the chamber, scrape off the cells from the top and stain the cells that have migrated through to the other side of the membrane. Counting takes time, but eventually I get enough information to tell me which drugs cause migration, and which can prevent it. I am sure you can appreciate, this is all on cells in a dish, and may not represent what happens in the body. A drug that performs well in my experiment have other effects on other cells in the body; it might make other cells die, or not work at all. This is very, very, very early stage research! As part of my PhD, I am also trying to understand how the drugs cause the cells to move which is a whole other ball game. Van Haastert PJ, Devreotes PN. Chemotaxis: signalling the way forward. Nat. Rev. Mol. Cell Biol. 2004; 5:626-34PubMed. Did you see my tweets about taking pictures, comparing them and subtracting them to get only the ones who are moving? Thanks! That is an interesting suggestion. At the minute I don't take pictures of all the wells I count (although I could, if I used a different microscope). The way I do it is quite old fashioned now, but it still works. 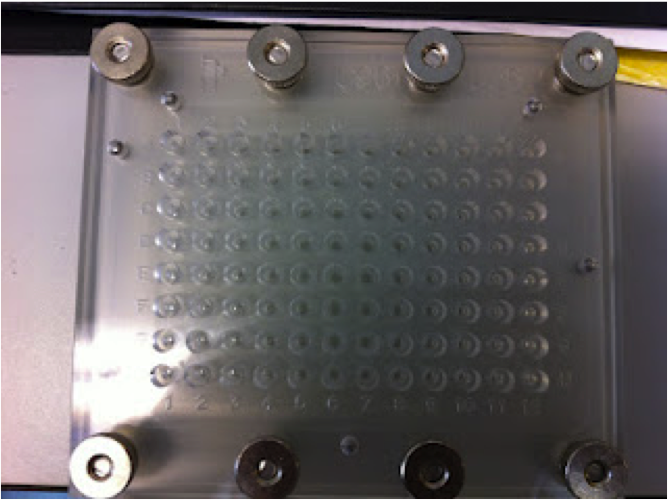 At the start of the experiment the membrane would be blank. To stain the cells so I can see and count them, I fix them - so they are dead. I wouldn't be able to do that at the start of the experiment. However, I do use another technique which is a slightly different set up and what I can do is stain the cells with a fluorescent label (that doesn't kill the cells) and read the amount of fluorescence that comes through the membrane (as the membrane is 'light tight'). I use a combination of the two methods. That's pretty interesting work you're doing. 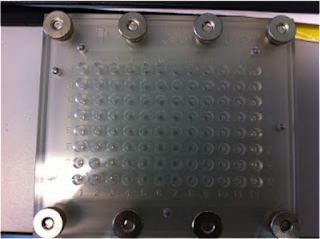 I must say that counting cells is quite tricky. As staring something under microscope for long hours really makes me dizzy. But then nothing is easy in this world. Thanks. 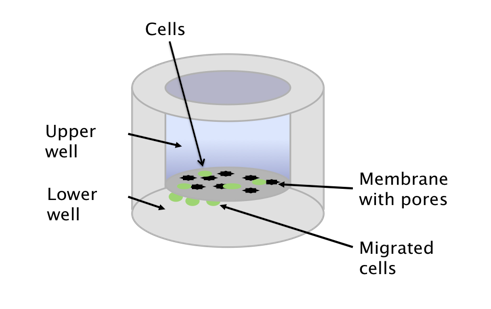 Counting cells can be tricky and it can make you feel very sea-sick! Luckily I don't suffer too much from that. I do have to remember to take breaks though! When you are sat in a room, on your own doing things like this all sense of time vanishes!! I have two strategies for getting my research into lay people terms. One (as described here: http://wp.me/p2oNGm-41) was writing my Granny a Guide to Genetics and Baking Biologist's PhD for Christmas one year when I was poor, and the other is explaining things to my broadly-scientifically-literate-but-Russian-literature-studying-housemate. If Granny and Belle can understand it then anyone can! Fabulous! You can lose all sense of reality if you spend too long talking to fellow lab mates...and only fellow lab mates! I do agree, being forced to explain something clearly and succinctly does make you think more and can make you understand your own work better. It's a great skill to have no matter what field you are in, or where you work. I love finding out what other PhD students do with their day! You can spend so long working on your own, sometimes you don't even know what other people you work with are doing! That's very true. When I have breaks in experiments I do often ask the other PhD student in lab 100 questions about what she's doing. I do think Biology is the most interesting out of the sciences. Shame I dropped it at AS Level!